Toyota Motor Philippines is gearing up for the third and final race of the Vios Cup Season 5 set to happen on Saturday, September 22, 2018 at Clark International Speedway, Pampanga. Bringing the race back at Clark should be exciting, coming from a thrilling race last July at Filinvest, Alabang. 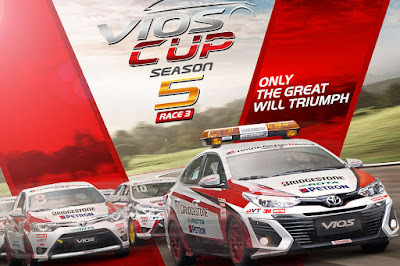 Motorsports fans can expect a whole new level of driving from the 53 racers composed of 46 drivers and 7 celebrity racers as they battle out for the title of Champion for Vios Cup Season 5! Gearheads should also expect heart-pounding races from celebrity racers such as Sam Milby, Diego Loyzaga, Sofia Andres, and Chie Filomeno with returning celebrities from last season’s race: Japanese-Brazilian model Fabio Ide, Sportscaster Gretchen Ho, and actor Troy Montero. Capping off this exciting season, Toyota promises nothing short of Waku-Doki for their motorsports fans at the event with various food concessioners, a selfie park, and other activities such as arcades and skid carts catered to the whole family. Gates open at 9 AM. Be there to meet & greet your favorite racers and watch them race up to 5 PM.